Most recently, the LPL joined several major research labs to create the BLRI. The institute combines the talents of numerous research scientists and will provide opportunities for scientific exchange, for staff, PhD students and post-doctoral researchers. Check for our calls regularly! We have recently examined eye movements during pronoun resolution, both in typically developing children and in adult readers with Down Syndrome. The materials comprised single sentences such as "La fourmi part avec le crabe. Il tient un drapeau", followed by two line drawings, with the sentence repeated underneath. 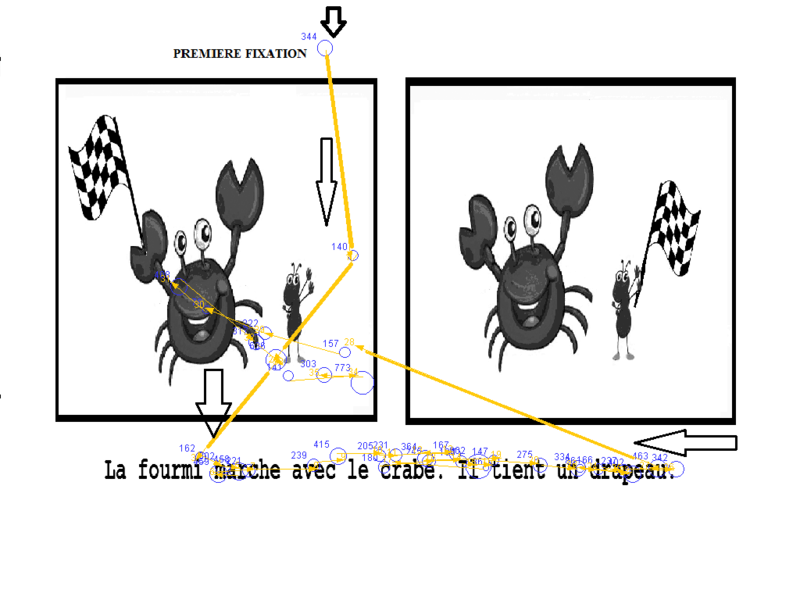 As visible in the example below, when grammatical gender ("la fourmi" and "le crabe") allowed immediate disambiguation of the pronoun, our group of Down Syndrome readers used this information to correctly chose the image that corresponded to the sentence. Our results showed that gender information was used significantly above chance.